The Diamond Sutra is one of the most revered texts of Mahayana Buddhism and a jewel of the world's religious literature. The Diamond Sutra is a brief text. A typical English translation contains about 6,000 words, and an average reader could finish it in less than 30 minutes, easily. But if you were to ask ten dharma teachers what it is about, you might get ten different answers, because the Diamond defies literal interpretation. The Diamond is part a large canon of early Mahayana sutras called the Prajnaparamita Sutras. Prajnaparamita means "perfection of wisdom." In Mahayana Buddhism, the perfection of wisdom is the realization or direct experience of sunyata (emptiness). The Heart Sutra also is one of the Prajnaparamita Sutras. Sometimes these sutras are referred to as the "prajna" or "wisdom" literature. Mahayana Buddhist legend says that the Prajnaparamita Sutras were dictated by the historical Buddha to various disciples. They were then hidden for about 500 years and only discovered when people were ready to learn from them. However, scholars believe they were written in India beginning in the 1st century BCE and continuing for a few more centuries. For the most part, the oldest surviving versions of these texts are Chinese translations that date from the early first millennium CE. The several texts of the Prajnaparamita Sutras vary from very long to very short and are often named according to the number of lines it takes to write them. So, one is the Perfection of Wisdom in 25,000 Lines. Another is the Perfection of Wisdom in 20,000 Lines, and then 8,000 lines, and so on. The Diamond is The Perfection of Wisdom in 300 Lines. It is often taught within Buddhism that the shorter Prajnaparamita sutras are distillations of the longer ones and that the brief and highly distilled Diamond and Heart sutras were written last. But many scholars suspect the shorter sutras are the older ones, and the longer sutras are elaborations. Scholars believe the original text of the Diamond Sutra was written in India some time in the 2nd century CE. Kumarajiva is believed to have made the first translation into Chinese in 401 CE, and the Kumarajiva text seems to be the one most often translated into English. Prince Chao-Ming (501-531), a son of Emperor Wu of the Liang Dynasty, divided the Diamond Sutra into 32 chapters and gave each chapter a title. This chapter division has been preserved to this day, although translators do not always use Prince Chao-Ming's titles. The Diamond Sutra played an important role in the life of Huineng (638-713), the Sixth Patriarch of Chan (Zen). It is recorded in Huineng's autobiography that when he was an adolescent selling firewood in a marketplace, he heard someone reciting the Diamond Sutra and immediately became enlightened. It is believed the Diamond Sutra was translated from Sanskrit into Tibetan in the late 8th or early 9th century. The translation is attributed to a disciple of Padmasambhava named Yeshe De and an Indian scholar named Silendrabodhi. An even older manuscript of the Diamond Sutra was discovered in the ruins of a Buddhist monastery in Bamiyan, Afghanistan, written in a language of Gandhara. A complete woodblock printed scroll of the Diamond Sutra, dated 868 CE, was among several texts preserved in a sealed cave near Dunhuang, in Gansu Province, China. In 1900 a Chinese monk, Abbot Wang Yuanlu, discovered the sealed door to the cave, and in 1907 a Hungarian-British explorer named Marc Aurel Stein was allowed to see inside the cave. Stein chose some scrolls randomly and purchased them from Abbot Wang. Eventually, these scrolls were taken to London and given to the British Library. It would be a few years before European scholars recognized the significance of the Diamond Sutra scroll and realized how old it was. It was printed nearly 600 years before Gutenberg printed his first Bible. The text describes the Buddha dwelling in Anathapindika's grove with 1,250 monks. Most of the text takes the form of a dialogue between the Buddha and a disciple named Subhuti. 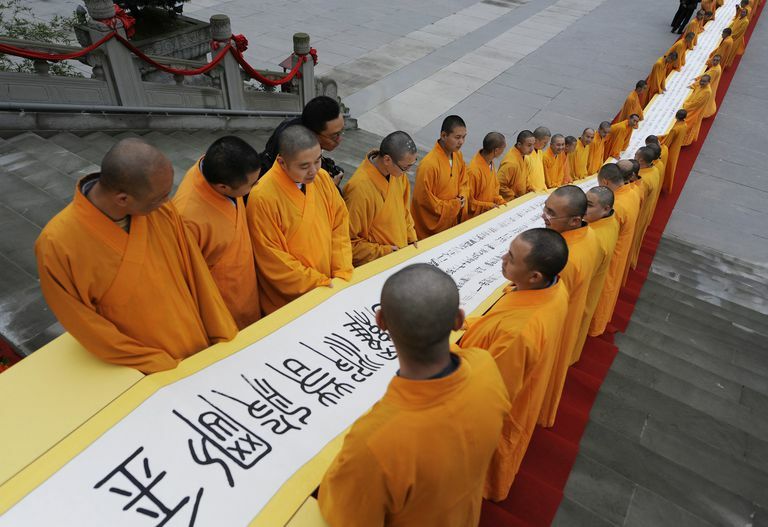 There is a common view that the Diamond Sutra primarily is about impermanence. This is because of a short verse in the last chapter that seems to be about impermanence and which often is mistaken as an explanation of the 31 enigmatic chapters that preceded it. To say that the Diamond Sutra is only about impermanence, however, does not do it justice. The verses in the Diamond Sutra address the nature of reality and the activity of bodhisattvas. Throughout the sutra, the Buddha instructs us to not be bound by concepts, even concepts of "Buddha" and "dharma." This is a deep and subtle text, not meant to be read like a textbook or instruction manual. Although Huineng may have realized enlightenment when he first heard the sutra, other great teachers have said the text revealed itself to them slowly. The late John Daido Loori Roshi said that when he first tried to read the Diamond Sutra, "It drove me crazy. Then I started to read it the way the translator suggested it, a little at a time, not trying to understand it, just reading it. I did that for about two years. Every night before I went to bed I would read one section. It was so boring it would put me right to sleep. But after a while, it started to make sense." However, the "sense" was not intellectual or conceptual. If you want to explore the Diamond Sutra, the guidance of a teacher is recommended. You can find a number of translations of varying quality online. For a more in-depth look at the Diamond Sutra, see "The Diamond That Cuts Through Illusion: Commentaries on the Prajnaparamita Diamond Sutra" by Thich Nhat Hanh; and "The Diamond Sutra: Text and Commentaries Translated from Sanskrit and Chinese" by Red Pine. What is the Vimalakirti Sutra?